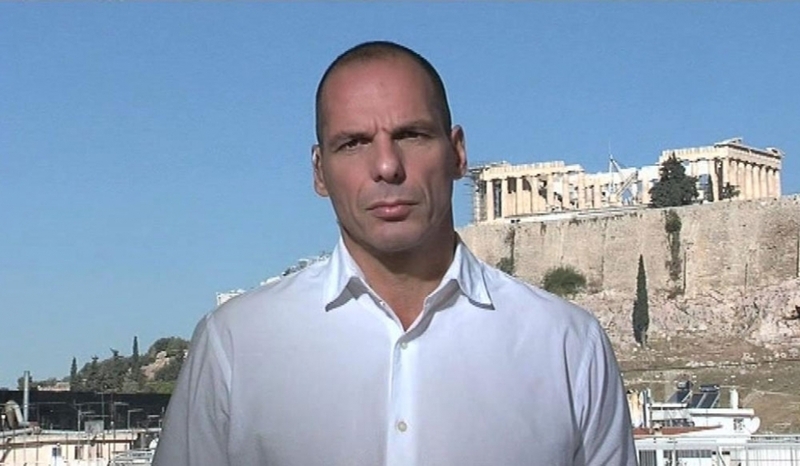 Yanis Varoufakis is a prestigious economist who heads the Department of Economic Policy at the University of Athens. From 2004 to 2007 Varoufakis served as economic adviser to George Papandreou. Author of several books on Game Theory, Varoufakis is also a recognized speaker and often appears as guest analyst for news media such as the BBC, Sky News, Russia Today and Bloomberg TV among others. In November 2010 he and Stuart Holland, a former Labour Party MP and economics professor at the University of Coimbra (Portugal), published “A Modest Proposal,” a set of economic policies aimed at overcoming the Euro crisis. Since the Greek Parliament approved the austerity measures and privatization program imposed by the troika back in June, we have witnessed how the government has been told over and over again that it is not moving fast enough in implementing such measures. In addition, Greece has been asked to carry out even more severe cuts in order to receive the bailout funds. Do you find the troika criticisms fair? What is your assessment of the sacrifices that are being asked of Greece and their effects on its economy? Fairness is besides the point. The troika has two simple aims: (a) To ensure that Greece’s creditors get as much of their money back as possible and (b) that the governments of the surplus countries of Europe are given a chance to pass through their Parliaments the measures which they think will buy them as much time as possible so as to make up their minds on what to do with the eurozone. The first task motivates the troika to supervise the Greek government’s efforts to collect more taxes and to reduce domestic expenditure. In this context, the troika is indifferent on how the Greek state does this. For example, it was quite happy to agree with the Greek government that the rich Greeks (who have for decades enjoyed a large degree of tax ‘immunity’) should be made to cough up an additional billion euros in taxes. When the government failed to extract this sum from the well-to-do Greeks, the troika said: “OK, in that case, reduce pensions and cut into the low paid workers’ wages.” The troika’s ‘class indifference,’ combined with the Greek government’s inability to corner the rich Greeks, meant that the poor Greeks are being bludgeoned by a barrage of tax hikes and income cuts unprecedented in peacetime. It is an important part of the troika’s remit to exact pain amongst the average Greek citizen in order pacify Berlin’s increasingly recalcitrant politicians. The troika’s second task is more complex. Every time Mrs. Merkel needs to summon enough support at her Federal Parliament (e.g., currently she needs to pass the changes to the European Financial Stability Fund, the EFSF, against substantial opposition from the own coalition’s MPs), it helps to be able to demonstrate to Parliamentarians that the Greeks have been made to bleed; that through acute pain they have been somewhat purified; that they have been, at least partly, transformed from undeserving to deserving beggars. Thus, it is an important part of the troika’s remit to exact pain amongst the average Greek citizen in order pacify Berlin’s increasingly recalcitrant politicians. In this sense, the immense pain of the poorer Greeks is the fuel that keeps Mrs. Merkel’s procrastination machine running, buying her more time during which to decide if Germany is prepared to tackle the Crisis’ true causes (the failing Franco-German banks plus the euro’s faulty underpinnings) or if it prefers to let it run into the ground before bailing itself out by recreating a new Mark. I began answering your question by suggesting that fairness is not the issue. The deeper issue is whether the combination of austerity and loans, which started in Greece and has spread to the rest of Europe, stands a chance of arresting the Crisis: It does not. Greater austerity deepens the debt crisis, does nothing to help cleanse the ailing banking sector, and pushes the whole eurozone into the trap of negative growth. Are Greek citizens aware of the fact that these bailouts are mainly used to pay back debt to (a seemingly insolvent) European banking system? Yes, I think that most Greeks are quite familiar with this sad truth. But they feel powerless to react meaningfully, a feeling that is magnified by the narrative which portrays them as spendthrift, corrupt, over-reachers. A narrative that emanates both from outside of Greece but also from establishment media here in Greece, of the sort that are attached to business interests keen to exploit the wave of privatisations and wage reductions. A few days ago, Minister Venizelos expressed that Greece was being humiliated, but that it should stay in the euro at all costs. Isn’t the troika risking pushing Papandreou into defaulting from an increasingly uncontrollable situation, as well as seeking political safe haven in a referendum? The Venizelos statement, that Greece will stay in the eurozone ad infinitum, was sensible but perhaps not for the reasons that motivated him to make it. My view is that no country can leave the eurozone without the eurozone collapsing in short order. Thus, it is quite accurate to say that Greece will stay in the euro till the bitter end. The real question is whether there will be a euro in a few years for Greece to belong to… As for the troika’s strategy, it is true to say that it is extremely dangerous. The troika’s hard ball tactics have, indeed, discredited Papandreou enormously within Greece. The only explanation is that they themselves (mainly the Europeans and the ECB) are in such a state of panic that Papandreou is, in their eyes, expendable. Regrettably so, maybe (since they appreciate his willingness to do as he is told, and his hitherto capacity to pass through Parliament all manner of hideous measures), but expendable nevertheless. Regarding the touted referendum, I have no expectation that economic policy or the agreement with the troika will ever be put to one. If it is, the government will lose spectacularly. What I fear the government has in mind is some anodyne referendum that will be stage-managed so as to allow the electorate to vent some of its anger against the government without jeopardising the agreement with the troika; e.g., a referendum on reducing the number of MPs, their salaries, etc. You have recently hinted that Germany’s ambivalence to effectively resolving the euro crisis is due to fear of losing clout within the euro zone. How so? Simple. Presently, each euro of debt within the eurozone belongs to a particular member-state. Even the EFSF loan guarantees are spliced up and each euro guaranteed is guaranteed by one and only one member-state. This means that a member-state can say: “I am off folks. Time for me to exit the eurozone. Tell me how much I owe you so that I can pay it and leave.” Of course, only a surplus country like Germany will ever contemplate doing this. For if a deficit country were to make such an announcement, it would cause a massive capital flight from the country in question, the result being a total collapse of its financial system. In short, the perfect separability of debts means that Germany can get out of the eurozone today. It may not want to (fearing a revaluation of its new currency and a loss of export markets), but it can. This ‘exit option’ gives Germany enormous bargaining power at the Council of Europe over deficit countries (France in particular) that lack it. And there is the rub: To fix the euro system, Germany must agree to the creation of a large amount of common debt. But if it does this, it will be giving up its ‘exit option’ (since the common debt will mean that it will no longer be able to pay its debts and leave the eurozone). Thus the conundrum: Germany can fix the euro by giving up its exorbitant bargaining power within the eurozone or keep its bargaining power and watch the euro system shrivel and die all around it. If Berlin comes to the conclusion that it wants ‘out’, it will get out itself before giving the green light to Athens to leave. Greece´s default and exit from the euro would translate into a nightmare: shortage of goods, bank runs, high inflation, massive devaluation, more unemployment, “brain drain”… However, Greece is already suffering tremendously and is in fact experiencing some of these affects already. In the absence of a real commitment to slicing its debt and supporting the country with an ambitious growth strategy, what is the incentive to stay in the euro? If Greece defaults and exits the eurozone there are two possible outcomes. First, that the rest of the eurozone survives the shock of a Greek exit. If this happens, Greece will sport two currencies: Left over euros and new drachmas. Inevitably, a black market in euros will emerge that saps whatever energy is created by the devaluation-induced rebound. The new drachma will free-fall in value and Greece will become like Kosovo: a province that uses the euro for its daily transactions without however enjoying any of the benefits of the eurosystem. With its real economy in tatters, we shall head speedily toward a new stone age. Secondly, the Greek exit spearheads a euro collapse. This means that Greece will be held responsible by the rest of Europe for ‘killing’ the common currency. A small country, already in the clasps of a gargantuan crisis, does not need the animosity of its neighbours and former partners. Of these two scenaria, the second is the most likely. I trust that a Greek exit will immediately trigger a German exit from the euro, as Germany will decide that enough is enough and recreate the Mark, preferring to battle recession in Germany than putting up to 70% of Germany’s GDP in order to bolster the unbolsterable euro. Which means, that a Greek exit from the euro is not on. Germany will not allow it. If Berlin comes to the conclusion that it wants ‘out’, it will get out itself before giving the green light to Athens to leave. At the present juncture, federal solutions are the final nail in the coffin of any prospect of eventual… federation. Isn’t the heart of the matter that Greece is not Mississippi and that Brussels is not Washington? Hasn’t the current crisis finally revealed that, unless we move toward the “United States of Europe” that Gerard Schröder called for a few days ago, or, at a minimum, a common fiscal framework, the European project is doomed? Yes and no. Yes, it has been proven beyond reasonable doubt that without common debt, a unified banking system and a common public investment policy, the euro system was ill equipped to survive the trials and tribulations of the post-2008 world. And yet, I say no to those, like Gerard Schröder, who call for a federalist solution. The reason I say no to a federalist move, at present, is because there is no chance whatsoever that democratic federal institutions can be put in place in the time left before the euro collapses. In this sense, anyone who suggests that the current crisis must be resolved by creating, e.g., a Federal Treasury is effectively throwing the towel in; admitting, that is, that the euro is over and, by extension, that the European Union has failed. At the present juncture, therefore, federal solutions are the final nail in the coffin of any prospect of eventual… federation. The mere announcement of the policy of transferring the servicing of the eurozone’s Maastricht-compliant debt to the ECB would end the debt crisis instantly. The “Modest Proposal,” a framework for urgent economic European policy you coauthored with Stuart Holland, seeks to alleviate the three most pressing issues in the euro system right now: sovereign solvency, confidence in the longevity of the euro project, and a proper vehicle through which jump-start the private sector in troubled economies. What would be the short term effects of your plan, not only in the financial markets, but also in the real economy? The mere announcement of the policy of transferring the servicing of the eurozone’s Maastricht-compliant debt to the ECB, which services it by issuing its own bonds (to be repaid by member-states in the long term), would end the debt crisis instantly. The second policy according to which the EFSF compulsorily recapitalises the banks Europe-wide would take a little longer to arrest the banking sector collapse; something in the order to six months. Lastly, the policy of allowing the European Investment Bank’ large scale investment projects to be co-financed by a net issue of additional ECB bonds would yield its growth spurt in the years to come. Having said that, I am sure, the very announcement of this policy mix will infuse considerable optimism in the mind of private investors to kick start private investment in the short run. What are the obstacles preventing proposals such as yours from being adopted in Europe? Two obstacles. First, Bankruptocracy (my term for the new regime we have been living under after 2008). Europe’s bankers are kicking and screaming against any suggestion that their banks ought to be recapitalised by the EFSF, since this would dilute their control over them. They are aided and abetted by politicians who prize highly the control of their national governments over banks (for the great benefits that this ‘special relationship’ with the bankers brings them). Secondly, Germany’s exorbitant bargaining power which, as I suggested above, will be lost if and when a solution, like that of our Modest Proposal, is enacted. One may argue that Germany’s strategy to keeping a robust export economy is based on the quality of its production (and adding aggregate value to the goods produced by low-cost manufacturing partners such as Hungary, the Czech Republic, etc.)? How do you see German trade exposed in the event of the emergence of a stronger euro/mark? Where would its markets be? While the quality of German manufacturing is to be greatly admired and commended, its wares will lose much of their appeal (in China, in France, in Italy etc.) if their price doubles. And double it will if the surplus countries join Germany to create a new Northern euro/Mark. Germany, therefore, is now facing a tragic tri-lemma: (a) Exit the eurozone, jettisoning the troublesome, debt-ridden periphery but at the expense of a deep recession engendered by the loss of export markets. (b) Stay in the eurozone, retaining the great bargaining power over its partners that its ‘exit option’ affords it, but at the expense of a continuation of the Crisis (which may, more likely than not, destroy the euro anyway). (c) Stay in the eurozone and fix the euro at the expense of its exorbitant dominance within the EU. Germany does not seem able to decide between the three options. Thus, the dithering, the indecision, and Greece’s slow, painful death. In connection with European trade in an eventually broken euro zone, what are your thoughts about the potential damage that the EU’s policies may have caused to the agricultural sector in countries such as Spain, Italy and Greece? Gigantic damage. Let us not forget that for decades now the ‘social contract’ in Europe, regarding agriculture (also known as the Common Agricultural Policy), was fairly simple: We pay you so that you destroy productive capacity (in order to keep prices up)! Farmers have gone along happily, in most cases, with this ‘contract’ since they pocketed subsidies in exchange for lost capacity. If the EU now collapses under the weight of this mess, then our farmers will lose their subsidies at a time when it is not clear that they can recreate the lost capacity. When on the 21st of last July the new Greek-Irish-Portuguese bailout was agreed upon, with the EFSF taking the additional burden on its toxic shoulders, Spain’s and Italy’s fate was sealed. Alarms went off in Spain on May of last year when its 10-year spread hit 164 bps. This summer it broke 400 bps, triggering the BCE’s intervention, and it now hinges on the 350-360 zone. In your opinion, when and how does Spain become a problem? Spain had entered the fray when Greece went belly up in May 2010 and the Spanish socialist government, in a state of panic, decided it was time to force austerity upon itself before ‘others’ did. Unsurprisingly, we re-learned the lesson that austerity is an unsafe friend and a cruel ally. Spanish growth slowed even more, attracting (rather than repelling) the speculators’ gaze. So, when on the 21st of last July the new Greek-Irish-Portuguese bailout was agreed upon, with the EFSF taking the additional burden on its toxic shoulders, Spain’s and Italy’s fate was sealed. For it became clear to the money markets that these two countries would be called upon to take on new debts on behalf of the EFSF; debts which they could ill afford. Thus, a predictable run on Spanish and Italian bonds began. The ECB’s purchases of these bonds in the secondary markets only slowed down the inevitable. Just like a year ago, when the ECB’s actions vis-a-vis Irish and Portuguese bonds did not prevent those two countries’ exit from the money markets, so too now the ECB’s frantic activity will fail too.